This month Swimming In Blood is released, the ninth volume in the Judge Dredd Mega Collection partwork. The Mega Collection has been spotty to date, but Swimming In Blood stands alongside the very first volume, America, as a classic of sequential art. Here are some thoughts on both works. America, by John Wagner and Colin MacNeil, details the tragic love story of America Jara and Bennett Beeny, two Mega-City One kids who’ve grown up together. They drift apart, America devoting her life to underground, increasingly violent agitation for a hard-line democrat group, while Bennett finds huge success as a singer of novelty comedy numbers. Despite the acclaim he’s gained, he is deeply unhappy, never having recovered from losing America to the political struggle she’s pledged herself to. 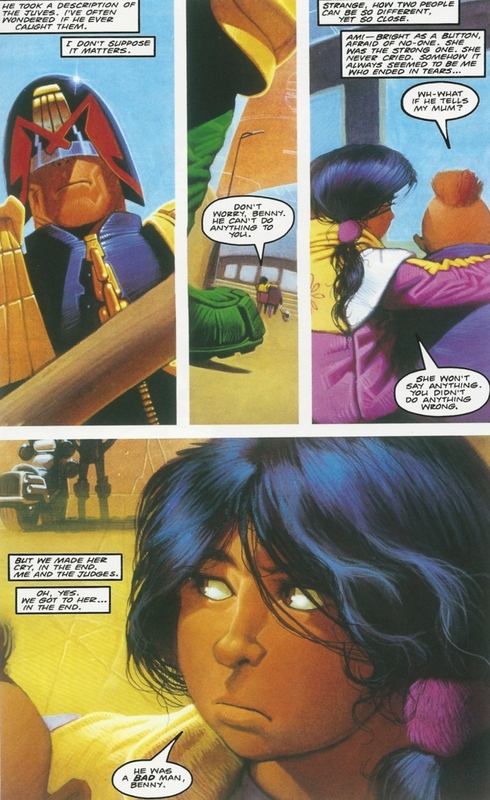 To say any more would ruin the tale, but Dredd – present only as a supporting character – is still centrally important to the story. America was one of the first Dredd stories to flesh out the stone-jawed lawman somewhat. This Dredd is angry, vindictive, uncertain and clearly not fully in control of the situation. He makes difficult decisions where there’s clearly no best option. He doesn’t engage in any of the unbelievable invincible action-hero histrionics of most of his stories. 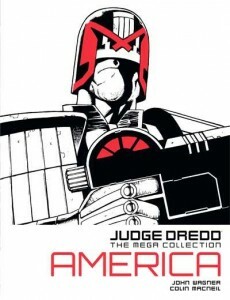 You might presume that America would detail some kind of existential threat to the judges’ reign over Mega-City One, but that’s not the case: it’s made quite clear that the democrats are more-or-less doomed from the start, arrayed against the superior technology and numbers of the judges. And it’s not a simple inversion, either; the democrats are violent, unscrupulous and bitter. 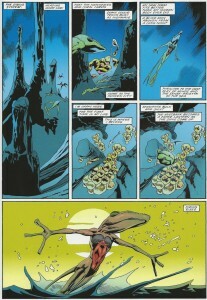 As the tale unfolds we get some direct narration from Dredd of his personal philosophy, and it’s fascinating. 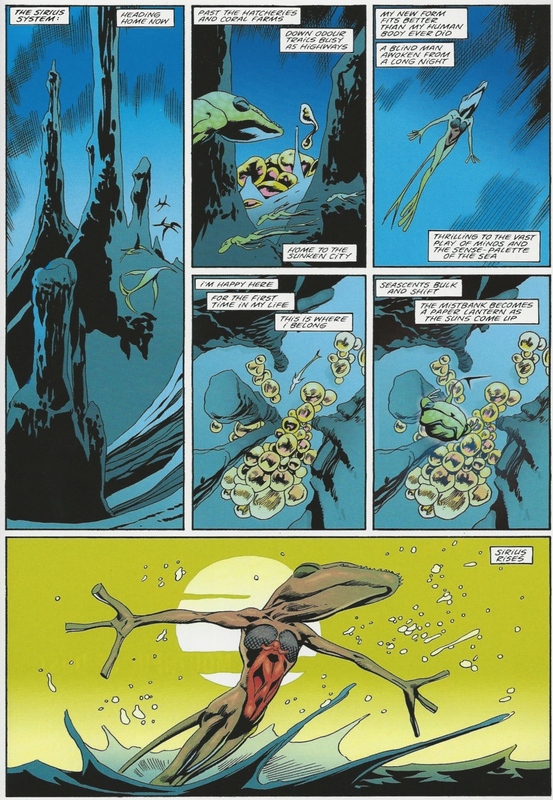 Anyone who’s read 2000AD for any length of time will have felt frustrated at Dredd’s archetypal nature, his unchanging, iron-hard worldview and two-dimensionality, so the glimpses we have here of Dredd as human (quite beyond anything published before or since, to my knowledge) are utterly compelling. It’s a familiar curse afflicting pretty much every franchised, non-creator-owned character; no publisher is going to want to kill off or radically change their property. 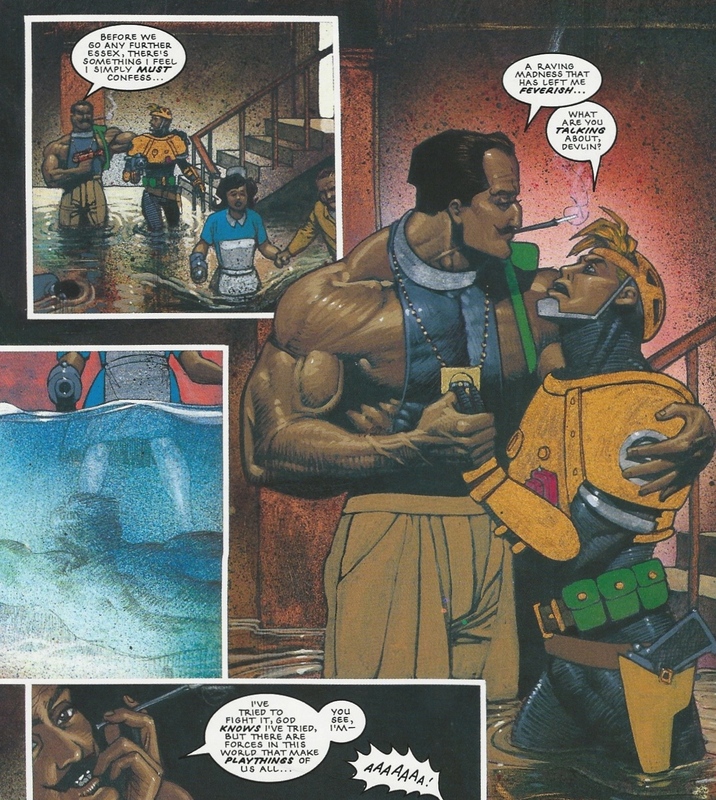 The payoff is that while America has been highly praised as “one of the best Dredds ever”, I wonder if anyone reading it who’s never been exposed to 2000AD before wouldn’t feel slightly underwhelmed. 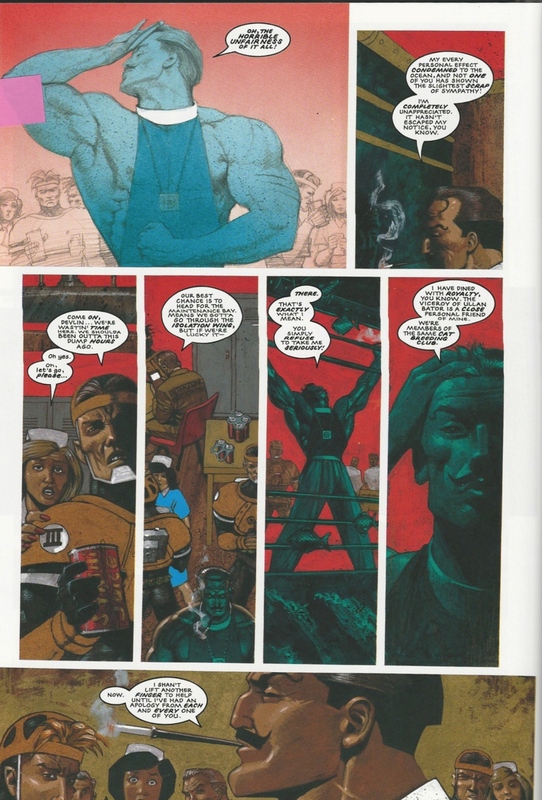 Much of what makes it so exceptional can only really be understood in the context of what had been Dredd’s entire ouevre up to the point it was published, in 1990. The volume collects every 2000AD and Megazine story dealing with America and Bennett and their extended circle, not just the original epic, and all of the follow-up stories are equally essential. Bennett’s robot butler, Robert, is written with such subtle skill and nuance that he turns into a starring character himself; gentle, principled and compassionate, some of his interactions with the other characters are genuinely affecting. The later stories introduce another character, a young judge who is mentored (in a fashion) by Dredd, and she too is handled with consumate grace by Wagner. 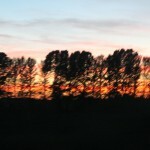 Her story also gives a valuable insight into the nuts-and-bolts workings of the judges’ system – they can, apparently, re-consider the verdicts and punishments they have meted out, but only the judge who has given the initial judgement can do so, no matter how much bureaucratic pressure is brought to bear. MacNeil’s art in the original story is fully painted and imbued with a warm, sunny haze that belies the darkness of the story while somehow fitting it absolutely; it reminded me of those thick, sticky summer days when we often begin our first excruciating lessons in love. 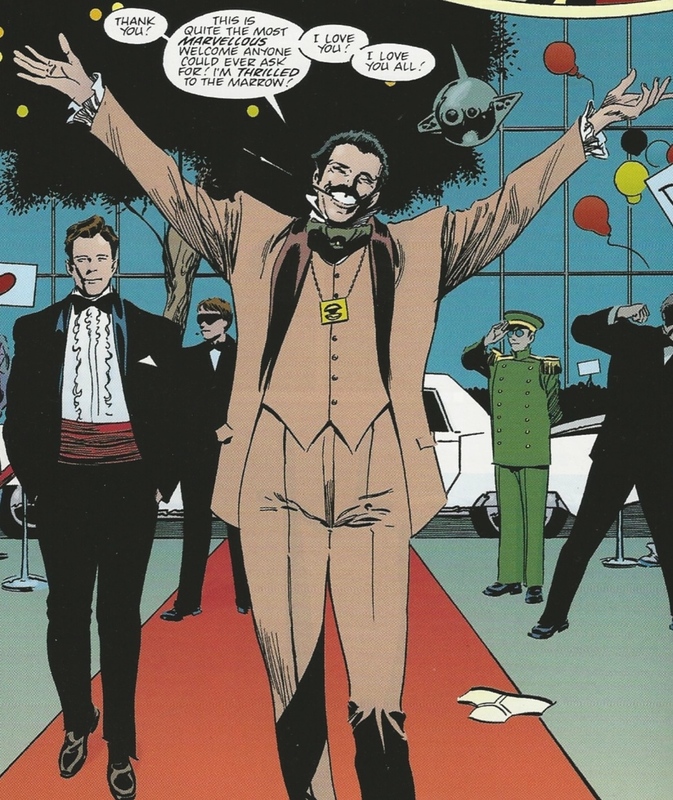 Most of the later stories are drawn in ink and coloured by a colourist, and it has to be said that MacNeil’s style suffers somewhat from the switch, with his work in the first follow-up story in particular seeming poorly proportioned and almost childish. 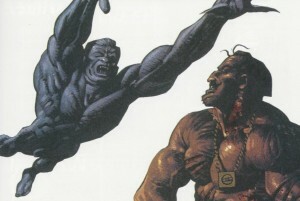 His artwork tightens up increasingly for the rest of the volume, until the very last story, a six-page one-episode reprint unconnected to America or Bennett (and written by Garth Ennis) which sees MacNeil return to painted art (this story was originally published in the early 90s, before any of the follow-ups). Despite its importance being best highlighted by the rest of the canon I would still recommend America as an introduction for anyone who hasn’t read any Dredd stories before, but they might then find much, or most, of the subsequent canon shallow and repetitive. That’s comics for you, I suppose. “Oh, the horrible unfairness of it all! My every personal effect condemned to the ocean, and not one of you has shown the slightest scrap of sympathy! Phillips’ artwork is the queasy flipside to Colin MacNeal’s shimmer; the work is bright too, with that same thickness which only comes from hand-painted colour, but there’s an injection of vivid grime here which is utterly suited to the tale – bright spots of blood on rusted ironwork and pulsing veins in torn skin. 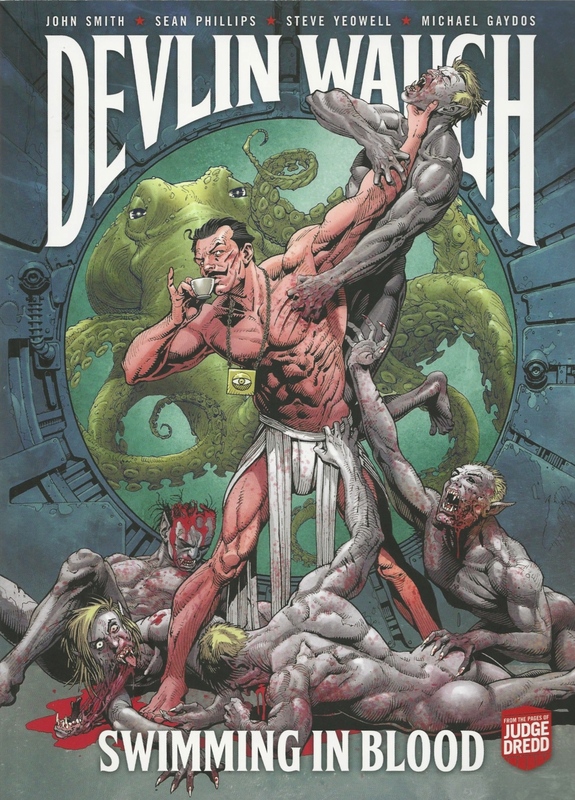 Waugh and the vampires are drawn as hugely muscled, but proportionally so; Devlin’s physique is realistic in that it resembles a world-class bodybuilder, tying in with a small reference in the story to his use and abuse of steroids. disturbing. Also unforgettable are the rag-tag group of occult criminals, most of them very nasty, who end up allies of sorts to Waugh. 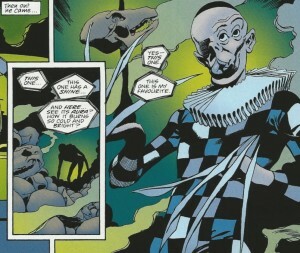 The art is by Steve Yeowell, whose clean and assiduously-proportioned work couldn’t be more different from Smith’s, and with typical understated brilliance he gives the characters, as silly and one-dimensional as some of them may be, genuine personality: menacing, vulnerable or grotesque as befits them. My only gripe is that Waugh here looks a bit too ordinary; he may have come off the steroids (we’re not told) but he now looks like Terry Thomas. Halfway through the story we meet Devlin’s mother. Like her son she’s acidic and scathing but is far from the evil harpy I’d expected – Smith confounds expectations by combining her biting wit with sincerity, and concern. And the final page of the saga features a genuine rarity for a John Smith story: something of a happy ending, for one of the characters, at least. 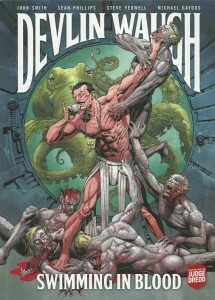 The volume finishes with a short prose story by Smith detailing an obsessed fan who stalks Devlin. Having read this years ago when it was first published in the early 90s, aged about twelve, I wasn’t expecting much on my recent revisit; Smith’s comic-book work is so overwrought and full of purple-prose that I expected this purely textual piece to be poor on re-reading. It’s not poor at all: it’s a masterpiece. Smith’s writing here is simultaneously warm and horrifying, and the clever denouement has stayed with me. My only real gripe with the 2014 volume is the cover. 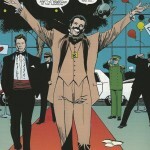 Cliff Robinson is a great artist, but he’s wrong for Waugh. The composition, too, is silly – Waugh is over-the-top, but he wouldn’t drink a cup of tea while fighting multiple vampires (who are exceedingly dangerous, it’s made clear). This cover has more in common with the kind of desperately-unfunny comedy sci-fi caper strips 2000AD periodically prints – stuff like Time Flies and Survival Geeks. 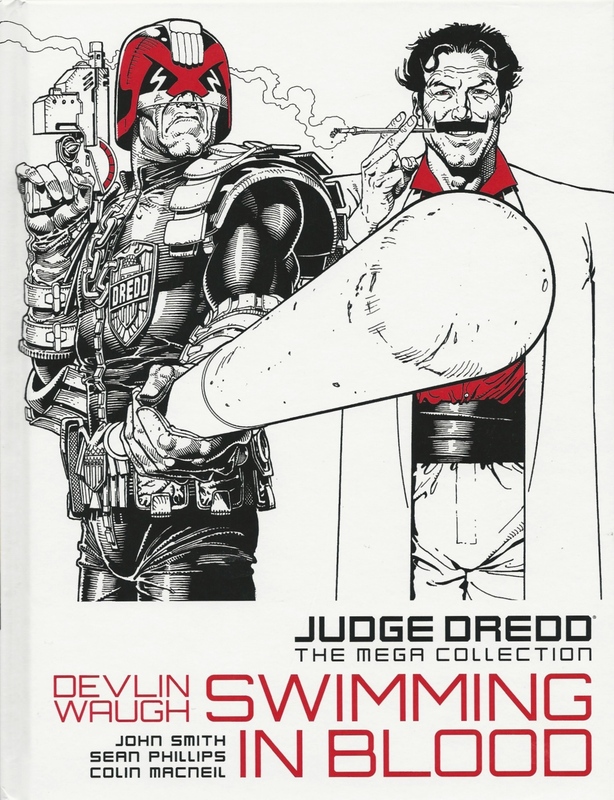 The Mega Collection cover isn’t much better, a rather camp effort with a side-by-side Dredd and Waugh, Dredd pointing a very phallic truncheon directly at the reader in what I assume is a winking nod to Waugh’s homosexuality (and perhaps Dredd’s own fetishistic design).